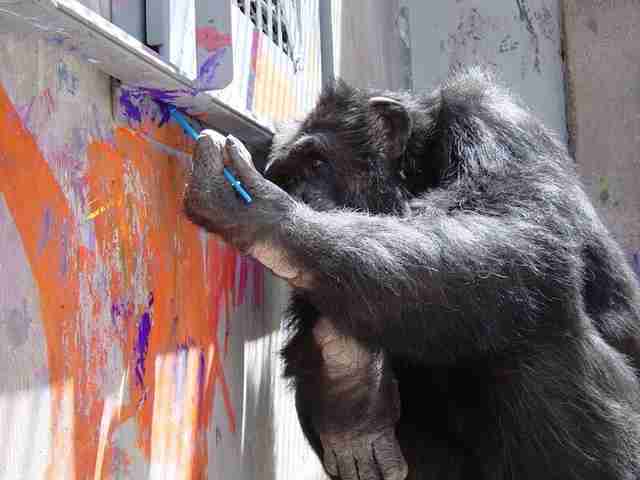 At 43 years old, Cheetah the chimp paints as if he’s been doing it his whole life. Sitting at his canvas, he gently opens up his paint jars and lathers a bit of yellow across the smooth paper with his brush. Pondering the next color to add, he sticks the end of the paintbrush in his mouth and pauses for a moment before mixing together two other colors to make the perfect shade. He swirls and dots the paint across the canvas, and even spreads a bit of bright purple onto his arms and lips. He likes to get messy when he’s working on a new masterpiece. 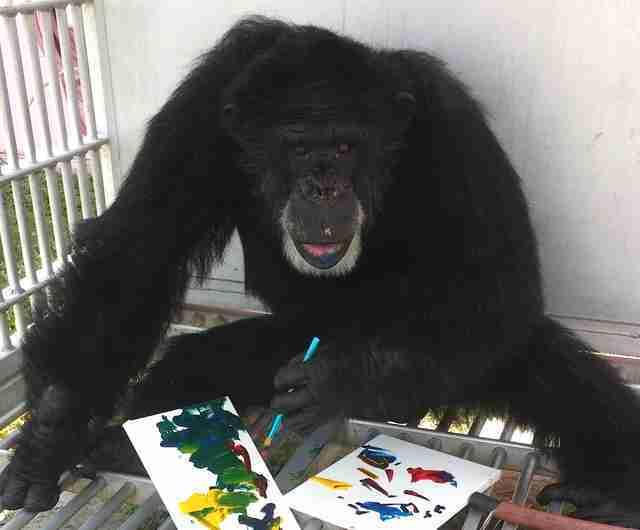 To an outsider, it might just look like he’s playing — but to his caretakers at Save the Chimps sanctuary, art has become one of the greatest therapies for the chimp, who has spent the greater portion of his life in a laboratory. Since the 1980s, Cheetah had lived in two different laboratories that frequently performed painful biopsies on his liver for hepatitis research. He lived alone and was never given fresh fruit or vegetables. 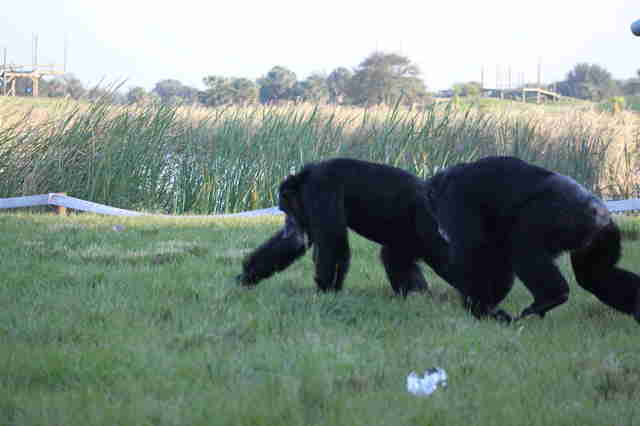 He rarely even saw other chimps, and his only interactions with people were with latex-gloved researchers. His caretakers estimate he was used for over 400 biopsies. The New Mexico lab where Cheetah most recently lived, named The Coulston Foundation, went bankrupt in 2002 and left all of its chimpanzee residents with nowhere to go. Save the Chimps began caring for the animals at the facility while it prepared to transfer the nearly 200 apes to its sanctuary. To make the chimps more comfortable while they waited to be transferred, caretakers gave them fresh fruit, vegetables, blankets and toys to play with. They also gave them some nontoxic paint, brushes and paper. It was clear from the beginning that Cheetah was a budding artist. 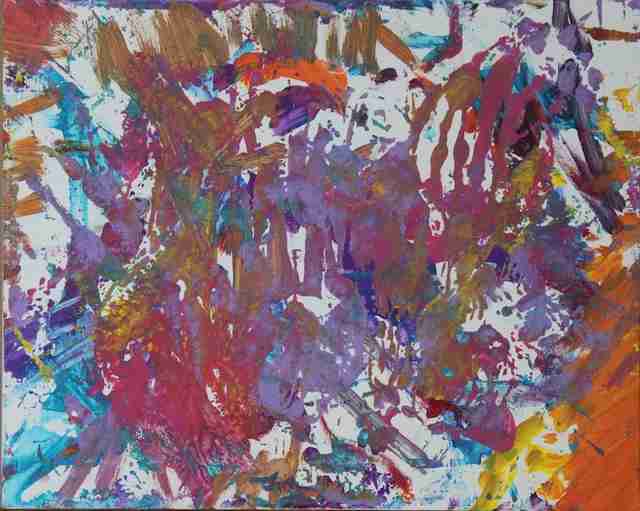 After being taken into a brighter enclosure, Cheetah went right to work splashing paint onto paper and even onto the walls. His paintbrush colored the boring concrete walls of the pen — his caretakers joked that he was trying to make his barren home look better. After so many years spent between scary experiments and staring at a wall, Cheetah finally had something in life that would bring him joy. Not only was Cheetah happy to liven up his room, but working on art helped him relax and have fun. 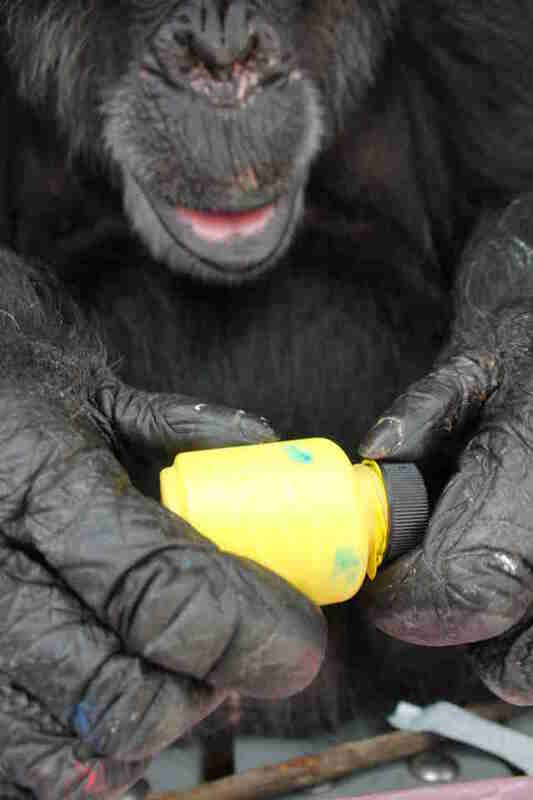 For decades, he had lived with no puzzles, toys or other activities to cope with the stress he lived through; art is used as an enrichment activity for many sanctuary chimps because it can help them unwind. Cheetah was also so glad to no longer be alone. Despite his history of being used in experiments, he took to his caretakers instantly and was just glad to be able to socialize with someone. 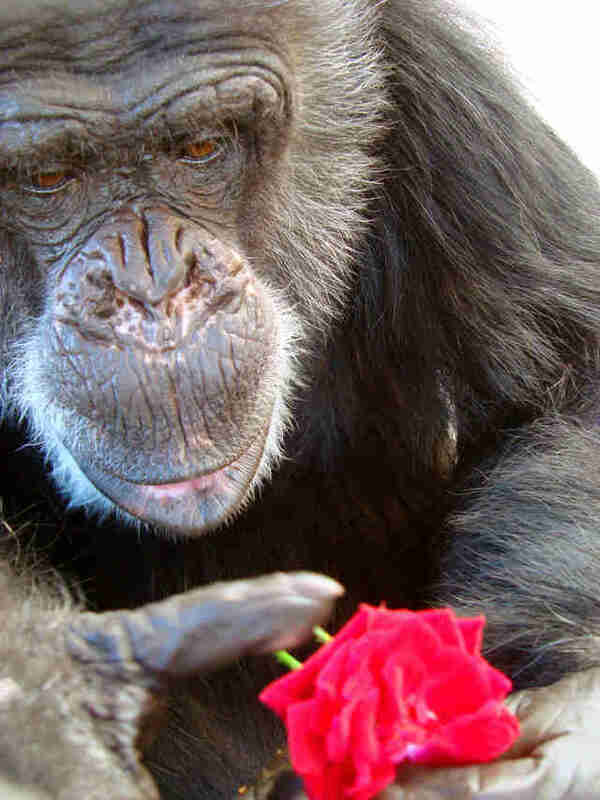 Since Cheetah was never raised in a typical chimp social group, he prefers the company of humans and his one roommate, Timmy, who was also rescued from the lab, instead of living in a traditional large chimp family. While a lot about Cheetah’s past before the lab is unclear, Halloran said it’s likely he was originally captured from the wild as a youngster — chimp moms are usually killed when their babies are taken so they won’t try to protect them. Halloran also said that, like any true artist, Cheetah waits for the right inspiration before starting a new painting. Some weeks he won’t even go near his paintbrushes — while other weeks, all he wants to do is spend time in front of a canvas. With all that time spent on his hobby, Cheetah’s talents haven’t gone unrecognized. “His paintings are some of the best ones here,” Halloran noted. 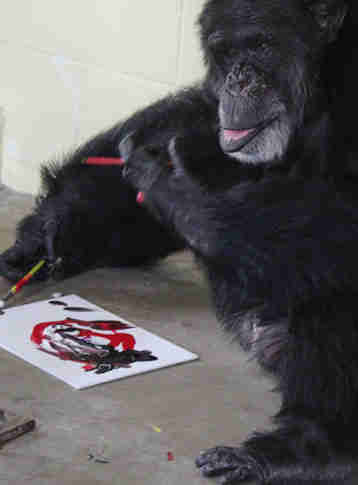 Since there are other rescue chimps who like painting, too, the sanctuary often sells their art online to fundraise. But it’s Cheetah’s sweet disposition, even after all he’s been through, that’s made him stand out most to his caretakers. 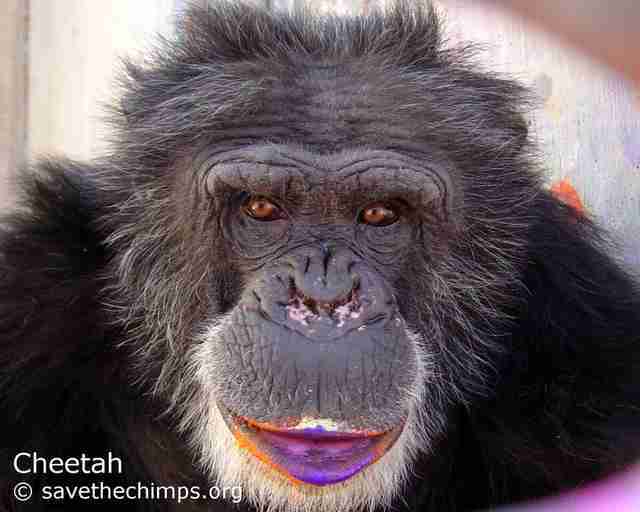 To support the care of chimps at the sanctuary, you can make a donation to Save The Chimps.